In this article, we are going to help you choose between Oakley Flight Deck vs Airbrake. 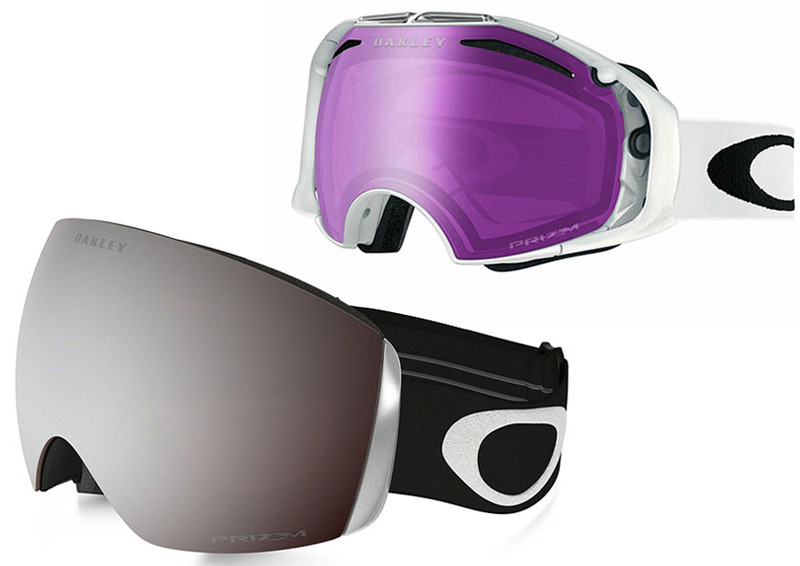 Both the Flight Deck and the Airbrake are popular ski goggle models from Oakley, but they have very different designs and features. The Flight Deck features a lens sub-frame attachment, which enables you to swap the lens easily. The lens is also wider. On the other hand, the Airbrake comes with the Switch Lock Lens Technology for fast and swift lens changing, along with two lenses in the bundle. Continue reading below for the detailed comparisons between Oakley Flight Deck and Oakley Airbrake. Oakley Flight Deck is actually the “full size version” of Oakley Flight Deck XM, which we previously discussed in Oakley Airbrake vs Flight Deck XM. If you are interested in compact ski goggles, be sure to check it out. Nevertheless, Oakley Flight Deck is a very classy and elegant ski goggle. It has a large lens which will provide better protection to the upper part of your face. It has a rimless design which is very stylish. The rimless design also makes it very comfortable to wear. It should be able to fit most helmets. The frame is made of injection molded polycarbonate for lightweight durability and reliability. The rigid exoskeleton is paired with the flexible O Matter faceplate, which is very comfortable. Oakley Airbrake, on the other hand, is not as tall, but it is pretty bulkier. This is because of the thick outriggers. Because of the outriggers, some people have some trouble fitting the goggle in their helmets. But this is not always an issue, so consider whether your helmet will be able to accommodate the goggle or not. It uses the same materials as Oakley Flight Deck, and it also features the flexible O Matter faceplate for optimum fit and comfort. Both Oakley Flight Deck vs Airbrake have interchangeable lenses. But they use different mechanisms. Oakley Flight Deck has a lens sub-frame attachment which allows fast and easy lens changing. It is easy and simple, but it takes a little bit more time than Oakley Airbrake’s mechanism. Also, the Flight Deck only comes with a single lens, so you will need the additional lens separately. Oakley Airbrake comes with the Switch Lock Lens Technology, which is very quick and swift. You just need to move a switch to release the lens, and move back the switch to lock the lens. If you often need to replace your lens, this mechanism is very practical and efficient. In addition, note that the Airbrake comes with two lenses that are optimized for low light and bright light environments, respectively. Oakley Flight Deck is definitely the winner in this aspect. It has a large, wide lens that does not have any rim. It offers an expansive field of view, and the peripheral vision is also very good. If you want to see the fullest of your surrounding, this goggle is one of the best choices available. On the other hand, the field of view of Oakley Airbrake is decent, but not wide. If you don’t need to replace your lens often, Oakley Flight Deck is definitely the best choice. It offers an elegant design and an excellent field of view. On the other hand, Oakley Airbrake’s quick lens changing mechanism can be very helpful for those who often need to replace their lenses to adapt to different conditions. But the field of view is more limited.